Car accidents in the Modesto area contribute to the more than 10 million auto and truck accidents that happened every year according to the National Safety Council. Injuries from car accidents range from minor aches and pains to death. In fact, according the U.S. Department of Transportation National Highway Traffic Safety Administration, there are over 30,000 people who die in a truck or car accident each year. The number has dropped from over a decade ago when over 40,000 people died every year in a truck or car accident each year. Those numbers include the over 3,000 people who died in California from a truck or car accident each year. California has a higher percentage of car accident deaths because of its vast highway and road infrastructure. Anyone from California can tell you about the traffic congestion anywhere in any metropolitan area. There is congestion because there are simply more drivers on the road here than anywhere else. 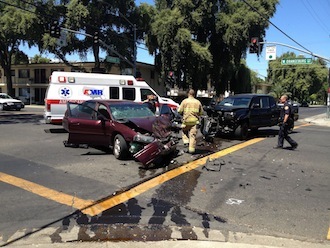 More California drivers means more accidents and therefore more injuries and death. Tailgating – According to the California DMV, tailgating is following a car or truck to closely. When following to close, the tailgating driver is unable to see the road or danger in front of them. When there is a sudden slowing or stop, the tailgating driver often times hits the car they are tailgating. The California DMV suggest to avoid tailgating by using the 3 or 4 second rule. When driving make sure the car or truck in front of you is at least 3 or 4 seconds in front of you. Distracted Driving – There are multiple causes of inattention. Texting or talking on a cell phone, putting on makeup, changing music, eating, shaving, talking to passengers, etc. The list goes on and on. Driving requires drivers to focus on the road. It is important to eliminate distractions such as using the phone or playing with the music while driving. Speeding – Speeding is one of the major causes of traffic accidents. Speedy coupled with reckless driving make car accidents much more likely to happen. The California DMV tells us that speeding can occur when the driving breaks the maximum speed limit and also when the driver is traveling to fast for the road conditions. Intoxication – Alcohol and drugs can affect a driver’s reaction time, reflexes, and other motor skills important to driving. Even when a person is found not guilty of criminal DUI, a person could be found civilly liable for causing an accident. Bad Weather – Road conditions can be a cause of rear end accidents. A wet road covered in snow, ice, slush, or simply rain can be a partial cause to a rear end accident. In addition high winds or blinding sun could also contribute to the accident. Ultimately, it is the driver’s responsibility to adjust their driving pattern to the driving conditions. Even if snow on the ground is the cause of the accident, the driver who did not use caution while driving can be held liable in court for the accident when they are found negligent. Spinal Cord Injury – Damage to the vertebrae, ligaments, or disks in the spinal column can injury the spinal cord. It goes without saying that a spinal cord injury can range from numbness to complete paralysis. The most common cause of a spinal cord injury is a car or truck accident. A car accident, even at low speeds, can result in compression of your spine and the disks located in the lower back area of the spinal column. It's often referred to as disc herniation. Even low speed accidents produce force and impact that can compress the spine of persons inside the vehicle. When there is compression of the spinal column it sometimes causes disc herniation. A disc cushions the vertebrae which protects the spinal cord. When a disc herniates it puts pressure on the spinal cord and surrounding nerves. The pressure on the spinal cord can cause pain, numbness, and limits ones mobility. skull fracture: breaking of the bone protecting the brain. contusions/bruises: the force from a car or truck accident can drive the brain into the boney edges inside the skull. This oftentimes causes bruising of the brain, which in turn can cause TBI. blood clots: can occur between the skull and the brain or inside the brain itself. Blood clots cause TBI and other brain related injuries. lacerations: the brain tissue can tear from the force the blow to the head causes. This in turn can cause TBI. nerve damage (diffuse axonal injury): is caused from cutting or damaging the nerve cells in the brain. This is another cause of TBI. The purpose of a seatbelt is to keep a person seated in a car during an accident. Unfortunatly, the impact from a car accident make the seatbelt the weapon which causes significant damage to the person. Arms, legs, shoulders, and other body parts are often damages by the seatbelt during a car or truck accident. Identify all drivers, passengers, and witnesses. Ask the driver for their name, address, phone number and insurance information. This can be done by exchanging insurance papers and driver license information. You can use a pen and paper to write information down or you may want to use your smart phone to capture photos of the driver license and insurance papers. Don’t forget to ask those standing around for their names and contact information. If you are injured you need to call the police and leave the evidence gather to the police. Photos of the damage and point of impact are particularly important. Close up photos and wide shots which include roadway signs, traffic lights, stoplights, stop signs, and other details help provide context when the photos are later reviewed. If the police are administering a field sobriety test on one of the drivers, you can use your cell phone to record these tests. Be sure not to interfere with the police administering the tests. Take the video from a safe distance, but close enough to capture the events. Photograph any evidence that is on the ground, such as alcohol cans or bottles. If the police respond, make sure to get the service number of the police report. You can pick it up from the police department in a few days for less than $10. The report will indicate the investigating officer's opinion of the cause of the accident. It will also show any tickets issued to the driver such as failure to yield, following too closely, reckless driving, etc. It will also show whether the driver has an arrest record for DUI or other infractions. If you are injured you must seek medical attention. Those who wait to seek medical attention are both putting their recovery at risk, but also putting their chances of recovering damages at risk. If you want to be a tough guy or tough girl, you will later regret your choice when you attempt to collect for your injuries. At the same time, if you are not injured, it is unethical and illegal to fake an injury in order to collect money for a false injury. Your doctor needs to confirm you diagnosis and that they were caused by the car accident. Often times the insurance company who represents the other driver will claim your injury was related to something other than the car accident. A medical doctor’s opinion that the cause of your injury was the car accidents is very persuasive when trying to settle your case. In addition to getting a diagnosis it is important to get follow up treatment. If your doctor recommends you get additional care and you fail to do so, it will adversely affect your claim. Serious injuries mean serious medical expenses and treatments, therapy and medications. The insurance companies may try to settle for an amount that only covers the basic treatments. 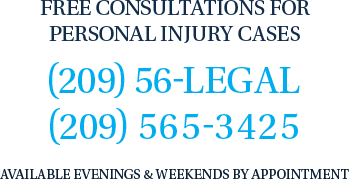 To protect yourself and fight for your rights it is absolutely necessary that you consult with a Modesto car accident lawyer. That attorney can help negotiate a settlement that will compensate you for your injury, your pain, discomfort and life altering effects of your injury. Someone has to at fault for the accident. This is also called liability. Sometimes there are multiple persons at fault. Even if you are partially at fault for an accident does not preclude you from pursuing money for damages you suffered as a result of another’s negligence. Most accidents are caused by reckless or negligent drivers. Reckless drivers put everyone’s safety at risk. Those drivers who cut other drivers off, pass on the shoulder or drag race, which causes an accident, are clearly at fault during an accident. But other times the fault is no so obvious. Texting while driving may be a factor in determining fault, as is speeding, tailgating or unsafe lane changes. Although almost all accidents are caused by human error, i.e. negligence, sometime accidents are caused by a car safety defect or auto design flaw. Defective rims, brakes, tires or any component on the vehicle can be the cause of the accident. It is important to consult with a Modesto car accident attorney to help evaluate fault in the accident so you can protect your rights.